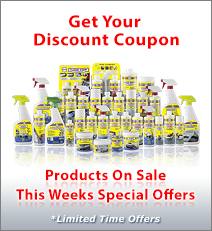 How to Save 100 Bucks on Bottom Cleaning? I am constantly asked if it’s safe to use straight acid or toilet bowl cleaners to remove Algae, Zebra Mussels or Barnacles from boat bottoms. Some acids or acid based products will damage fiberglass. Some immediately and others over time so the damage is not readily apparent. If the product is not inhibited, buffered and tested you would do well not to use it on your boat. Some of these products will soften the fiberglass, others will etch the pores in the gelcoat, promoting osmosis blisters while others will pull the plasticizers our making the gelcoat brittle and subject to stress cracks. Using these products can void the manufacturers’ warranty. To illustrate this, I dug up the following photograph from my archives. A few years ago I was visiting marine dealers and noticed this 28 footer on his lot. All the cracks were below the waterline. “What Happened?” I asked. 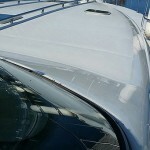 The exterior gelcoat layer of a boat is not as resistant to chemical attack as the underlying polyester/fiberglass layer because of the fillers and pigments used to add color. You must be careful what you use. 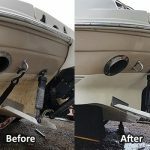 If you plan to experiment with different cleaners or acids, I suggest that you test them first on scrap that you can afford to damage before you ever subject your boat to them. When we invented Algae Strip (Worlds first chemical bottom cleaner) 30 years ago we did extensive testing in the lab and then in the field: first on gelcoat, next on scrap pieces of fiberglass coated with gelcoat and then on old boats. 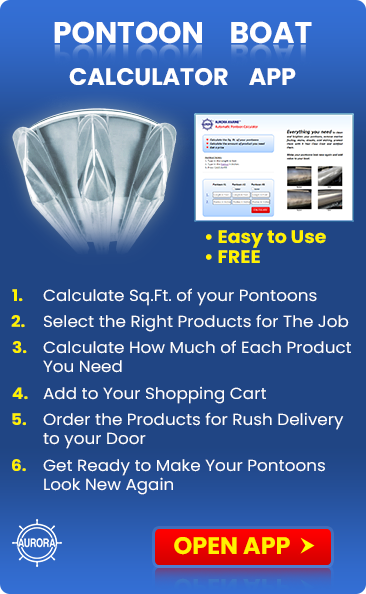 Only when we were convinced that we had a safe, effective product that we could stand behind, did we make it available to boat owners. We discovered that straight acids could cause damage to the gelcoat, that’s why Algae Strip is a blend of different acids that work in synergy. It’s also inhibited and buffered. In 30 years it has been used successfully to clean hundreds of thousands of boats without ever damaging a single one. It’s still the industry standard. Since then, Aurora Marine has invented numerous other specialty bottom cleaners, adhering to the same rigorous test and evaluate methods. There is Waterline Stain Remover for fiberglass, Algex for cleaning aluminum boats as well as stainless and bronze props, Inflatable Bottom Spray which is safe for RIBs and Inflatable Boats and our newest invention, Green Genie for fiberglass which replaces acid with salt making it safer and greener, yet still very effective at stripping marine growth. All of these products are completely safe for their intended use. For each success that we have had, we have had hundreds of failures. We’ve damaged a lot of scrap gelcoat, fiberglass, aluminum, stainless steel, bronze, PVC, Hypalon and other materials. Many of the chemicals that we tested could not be used because they damaged the test material or were injurious to the environment or were too dangerous to use by consumers. If you have the time and resources to experiment with different chemicals, you just might invent the next wonder product. But, do it on scrap, not on your boat.